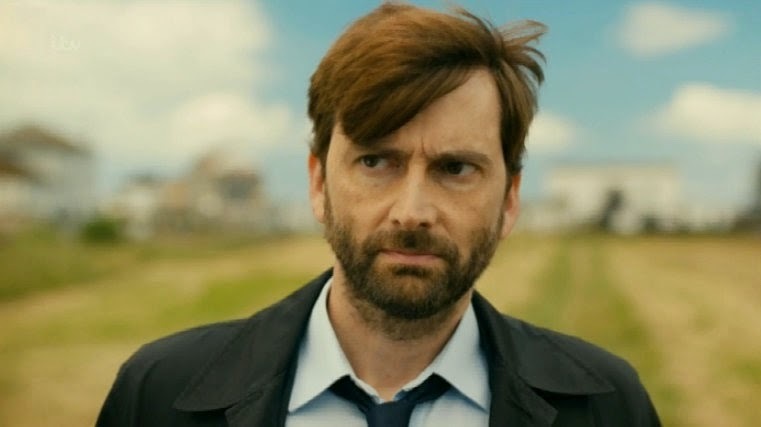 The Custard TV: Broadchurch goes bonkers! There was little to no press before this series of Broadchurch. The one thing writer Chris Chibnall did tease was that it viewers could expect 'a very different kind of story.' 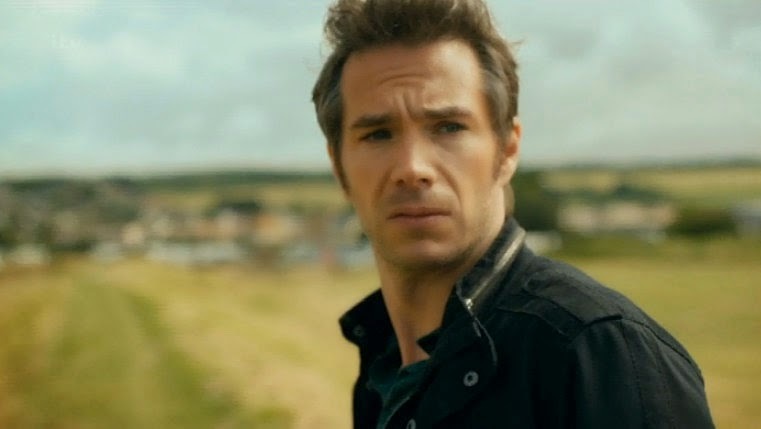 He wasn't wrong, because where Broadchurch was once a reliable, tension packed drama full of real life characters, this series has proved once an for all that lightning rarely strikes twice. I was a bit disappointed with last week's opener, but I laughed out loud at times during its farcical second episode. The second episode saw the start of the Joe Miller trail, as his wife and a mumbling David Tennant played matchmaker between the woman Tennant's character is holding under 'witness protection' and her husband who Tennant's character has always believed was responsible for the disappearance of two teen girls. Sound utterly ridiculous? I know! I sound full of vitriol, but I genuinely can't believe how awful this series has become. I so wanted my preconceptions of this second outing to be proved wrong. I wanted egg on my sceptical little face, instead with each moment I spend in that gorgeous seaside town, I feel a little fed up. What exactly has gone wrong? Without wishing to repeat my original review last week, I think it's down to one simple thing: we didn't really need a second series. All this series has proved so far is that there isn't another story to tell. Chibnall has always maintained that Broadchurch was less about the whodunnit and more about the effect of this awful crime had on a tight nit community. Sadly for Chibnall it was his masterfully crafted mystery story that got the nation talking back in 2013 and without the mystery element the series loses its appeal. He must appreciate this as he's tried his best to add in a mystery surrounding the Sandbrook case. Sadly, the Sandbrook holds very little interest and I find the fact that Hardy's been holding this woman hostage all this time truly bonkers. There are times that series shows its former self, mainly in the scenes that see Olivia Colman's Ellie battle with her life in the shadows of her husband's crime, but there are to fleeting to hold the series together and we're subjected to moments of madness with Hardy rigging Ellie's former home with cameras in hopes of his suspect Lee Ashworth spilling the beans on the whereabouts of these missing teens. Perhaps Chibnall is missing a trick not letting the audience spend time with the families involved with the Sandbrook case so that we can feel empathy for them, instead we're asked to care about this case we know virtually nothing about. The final moments of this episode which saw an angry Beth Latimer go into labour as 'villain' Lee Ashworth kidnapped his wife. That irritating score was there indicate this was a massive twist and I should be on the edge of my leather, instead I saw it coming the mile off. And I struggle to see why I should care why a man has kidnapped his wife from a man who was also holding her hostage in his cabin. It's truly bonkers. If a soap did the same storyline the majority of us would be saying how incredibly unrealistic and silly it was, somehow ITV think this is a plausible Monday night drama, but I seriously question whether I'll last the run of eight episodes if it continues to self destruct like this. The terrible decline of what was once a good solid drama is painful to see. I also thought last night was funny but in the worst possible way. I notice that the ratings for episode two are way down so most people are already voting with their remote controls. I think this may be the most rapid move from acclaimed BAFTA drama to shark jumping in tele history. Please don't waste your time with this garbage any more and devote more time to better and more interesting shows. I feel sad now when I read anything about Broadchurch as it all says the same thing about how bad it now is. When you start to yell at your tele, it's a good sign you shouldn't keep watching what you are watching. I totally agree that the big mistake is trying to create a plot thread around the Sandbrook case. The producers haven't really paid proper attention to their own show as the Hardy character is undoubtedly the least well written and interesting from the first series and only serves as a contrast for Ellie and to some extent a chorus for her dreadful journey from cheerful innocence to complete loss. There was nice chemistry between the two actors and whenever David Tennant was in a scene without Olivia Colman, you could feel the difference as his character just didn't work at all. What they have done is try to create a separate strong journey storyline for Hardy. Because the original character was not well developed, they have had to create a preposterous parallel witness protection story. It also means that David Tennant is left adrift as he only shined in the first one when Olivia Colman used him as her 'straight man' in their funny little exchanges. Tennant the actor and the character of Hardy simply aren't good enough to shoulder this new storyline. This has meant that the actor and plot lines have had to fall back immediately on melodrama. It's almost criminal that the producers encouraged Chris Chibnall to wring out a new story which simply was never there just to make more money and to give Tennant and Colman some prime time exposure. It has now backfired quite spectacularly and fair enough too. One of the most fascinating things about the failure of the Broadchurch sequel is how online papers are really cashing in on click bait articles to let readers know how appalled the British public is that their beloved Broadchurch has descended into dreadful soap. The Daily Mail has run probably a dozen articles pointing out the david Tennant mumbling outrage, the lack of legal veracity outrage, the silly plot outrage and the destruction of credibility outrage. The Star, Express, Standard, The Sun and a couple of the quality papers have followed suit. Part of the way viewers have flooded the articles gleefully with comments about how happy they are that this has failed, or why they turned off in disgust five minutes in, or that they only wanted to comment to let people know that they were too intelligent and discerning to watch anything but Spiral or The Bridge - original of course, reflects the culture of cutting down the tall poppies. The original was insanely popular and yes, definitely overhyped for what was a pleasant enough thriller and it almost as if people now feel embarrased for getting caught up in the hype at the time. Others are taking delight in yet another flop by David Tennant, an actor whom most commentators seem to particularly dislike due to what is seen as unwarranted popularity given his limited acting abilities (to sum up many comments). The whole thing is strangely cathartic and slightly hysterical - it is a television programme after all, not anything of importance. Anyway, with a further drop in ratings next week and no doubt more silly plot twists and Tennant boggled eyed staring, it will be interesting if the red tops keep up pursuit of their quarry. The poor show is already lying exhausted and bleeding from the ctitical and audience mauling, why bother when there are other icons to pull down and gloat over!